If there were a Nobel Peace Prize given to Americans who are actively working to promote smarter, healthier, more sustainable ways to consume food, then mother and son Vicki and Evan Marks would certainly be candidates. Consider them sustainable food heroes. Seven years ago they began the annual Green Feast, Orange County's premiere celebration of local, organic farmers, fisherman, vintners, bakers, ranchers, beekeepers, and cheesemongers, which has blossomed into Southern California's best outdoor conscious foodie event. Featuring seventeen of Orange County's finest chefs volunteering their talents and services, The Green Feast takes place in the lush fields of the Ecology Center, a groundbreaking haven for environmental education for which the event is also an annual fundraiser. 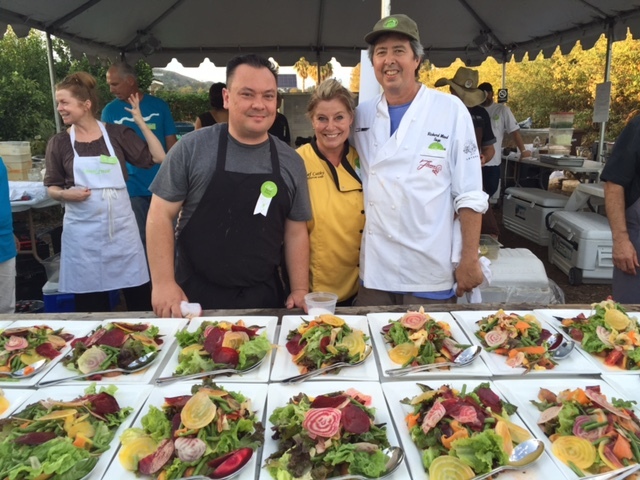 This year's Green Feast raised 80 thousand dollars to benefit The Ecology Center's educational programs. True to its name, The Green Feast sources all ingredients (even flour, sugar, and salt) from within a 250 mile radius of the Ecology Center in the historic hamlet of San Juan Capistrano. The feast began with appetizers, but The Green Feast's App-Off is anything but your typical appetizer experience. 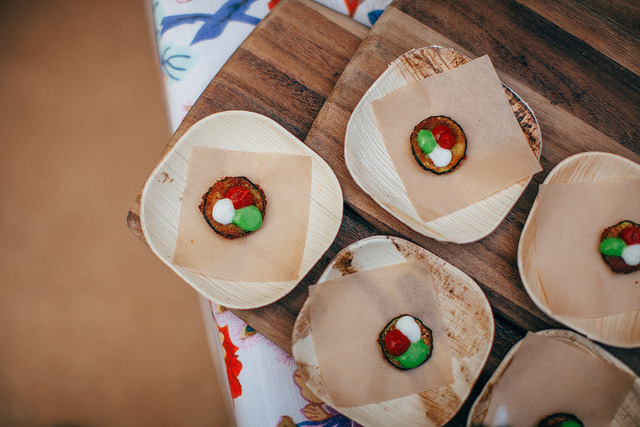 Part competition, part nature walk and a treat for all five senses, renowned local chefs are stationed throughout the Ecology Center's beautiful, maze-like grounds offering their diverse, bite-size delicacies while diners vote (with mung beans) on their favorite dishes. Since every appetizer neared or achieved perfection, voting was difficult, but in the end my pick went to the most heavenly and simple anchovy and shishito pepper dish this side of Italy. Chef Raj Dixit of The Stonehill Tavern (St Regis Monarch Beach) went kayaking in Dana Point Harbor just before The Green Feast to catch the beautiful, addictive and light as air wild anchovies. Unfortunately, Chef Raj's acclaimed Spanish Omelettes presented in eggshells had vanished by the time I arrived. Other App-Off highlights included Chef Jeffrey Boullt of Social's smoked potato salad with charred green beans, house made creme fraiche, soft boiled eggs and vadouvan -- the best potato salad I've ever had. Chef Joe Magnanelli & Brent Omeste of Cucina Enoteca's local baby zucchini "parmigiana." Chef Michael Doctulero of Scott's Seafood's chilled local white seabass ceviche in treviso with smoked chilis -- sublime. Justin Monson of Club 33's blackberry-basil and Drakes Farm goat cheese popsicles -- very refreshing during Indian Summer's heatwave. Pascal Olhats of Pascal Restaurants' slow cooked, grilled pork belly with Manassero Farms white corn and tomato cassoulet. And last but not least, Debra Sims of Maro Wood Grill Chimichurri Gnocchi. Incredible. The winner of the App-Off gets to be the main course chef for next year's Green Feast. Green Feast's Director Evan Marks began his career in Africa, where his innovative farming ideas transformed the local communities, but ultimately he chose to take his skills and passion for the environment back to his home land of Orange County, which had suffered a drastic reduction of farms in his lifetime. The way I see it, the future is very abundant. We are in charge of our destiny. We can design what our future looks like. You either create scarcity or you create abundance. Most people the psyche is scarcity, but what if we consciously created abundance? There are far fewer farms today than there were in the mid-Twentieth Century. Orange County was named for the vast fields of citrus growing here. 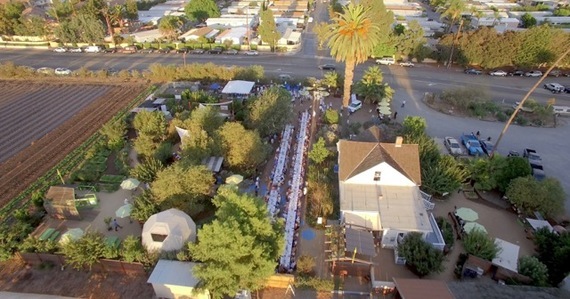 Today we have one or two dozen farms in Orange County today for three and a half million people. Post War farming was a livelihood and people tended to eat simpler, locally grown food. There was a Mom and Pop farmer on every corner. Then all of a sudden the commoditization of food changed. And the fast food chains and the larger suppliers like Costco and Walmart took over. I want to flip that around. We can all grow food in our backyards. Los Angeles is full of empty lots -- those could be gardens. One squash seed bears a tremendous amount of vegetables. One seed could create a vine of food to feed dozens if not hundreds of people. People should be asking "where does my food come from? And what if instead of going to Costco to buy groceries, we went to Jim's farm? The sit-down dinner portion of Green Feast consisted of four courses, kicking things off with Chef Cathy McKnight's rainbow-inspired Farm Salad. Fire roasted heirloom eggplant (grilled in foil packets), Sicilian tomatoes, garlic, grilled peaches, carrots, beets and a grilled okra used in lieu of a crouton. The citrus vinaigrette dressing was light, flavorful and sweet with a base of red bell pepper, ginger, shallots, garlic, rice vinegar, olive oil, local mango honey with a dash of orange juice. It was so light that you would never know there were that many ingredients involved. Cathy launched modelmeals.com only two months ago -- a meal delivery business focused on locally sourced, organic, healthy meals that deliver to all of Orange County, Los Angeles and Long Beach. 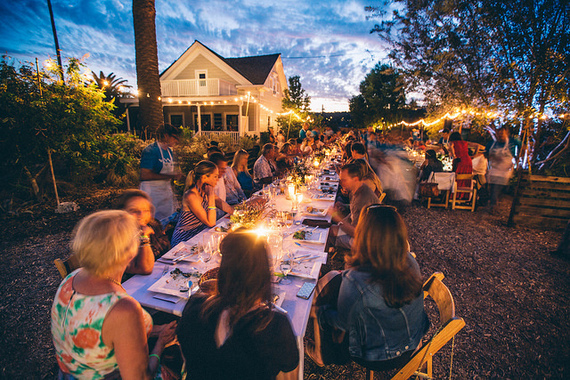 One of the things I most love about The Green Feast is the opportunity to experience all of Orange County's cornucopia of harvests. The main courses included Newport Beach Dory Fleet Crab Soup, yellowtail tuna poke, and herb roasted lamb. Chilled summer squash salad and a warm Moroccan bean ragout rounded out the dinner nicely. 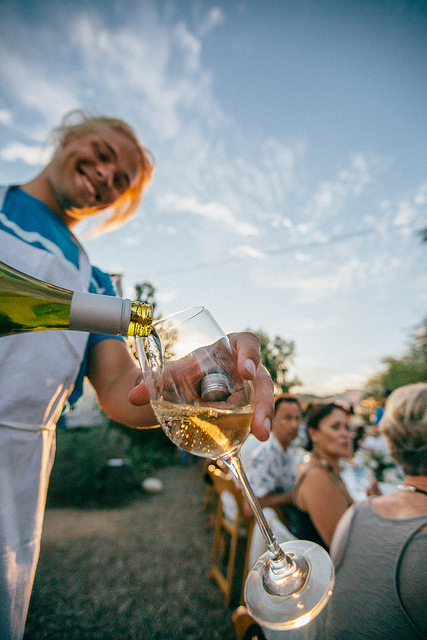 Wines included the region's finest: Sans Liege from Paso Robles, Palumbo Family Winery in Temecula, Schaner Family Farms in Valley Center, and Zotovich Cellars in Lompoc. Desserts were crafted by Chef Debra Sims (Maro Wood Grill), and Kerri Cacciata (Local Tastes Better, TEC Chef in Residence) with a trio of Tri Color Olive Oil Carrot Cake, Goat Cheese & Fennel Panna Cotta, and a Fig Tartlette. Orange County is also the home of Kean Coffee created by local coffeehouse visionary, Martin Diedrich. Kean's delicious coffee was duly enjoyed by The Green Feast's 225 diners and scores of volunteers. Beyond The Green Feast, Evan Marks lives and breathes environmental consciousness all year long. A resident of Oceanside and an avid surfer, he has collaborated with Hurley (the surfing company) on a campaign to get rid of single use plastic bottles at Trestles Beach in San Clemente. We use billions of waterbottles and most end up in landfills or the ocean - they are not actually recycled. It takes six gallons of water to make one little plastic bottle. So what if we were conscious consumers and used a re-useable bottle for water that we could wash and continue to use to not create waste? So with Hurley, we've been distributing reusable bottles over and over again and we're getting fifty thousand teenagers to convert from wasteful disposable bottles to reusable bottles. 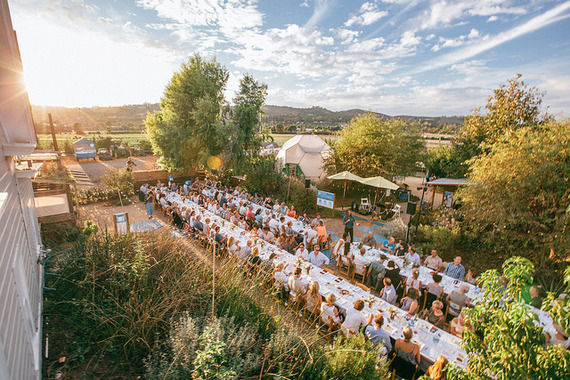 Evan and Vicki Marks are already planning next year's Green Feast, and I encourage farm-to-table fans from all over the country to come to San Juan Capistrano next September to check this out. Vicki says doing The Green Feast has changed her in many ways over the past seven years. It has made me rethink of food and where it comes from. I scrutinize the source of the food and what kind of food it is. I am not willing to just eat anything. I have a hard time with fast food. I will do Chipotle because of their sourcing. 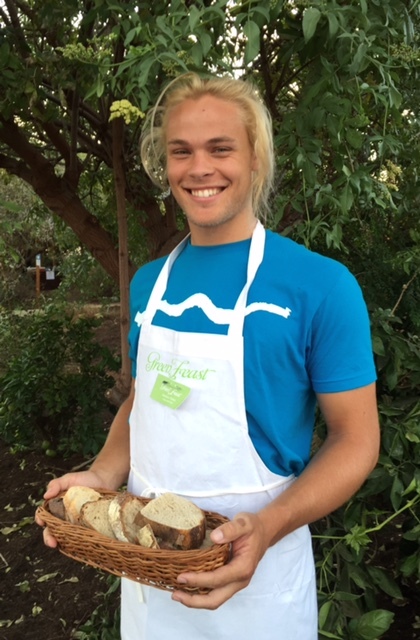 I live in San Clemente and go to the local restaurants that these Green Feast chefs run because I know it is locally sourced, conscious, and healthy. These chefs walk the walk. Ninety percent of the produce I buy is organic because why take the chance? I prefer to eat food that is more naturally grown. 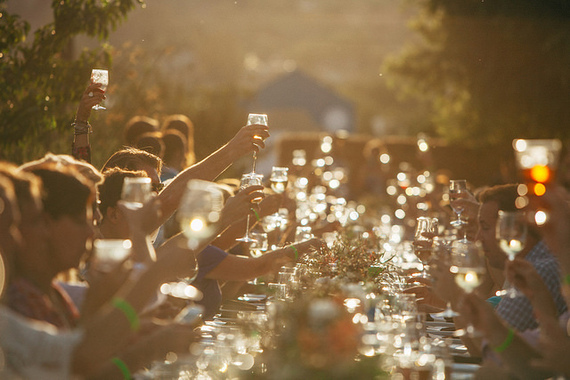 When we started this seven years ago it was hard to find organic or biodynamic winemakers, but fortunately this conscious, organic way of eating and farming has grown, and now to find an organic winemaker is not that much of a challenge. I am very hopeful for the future.